The strength and success of CANENA comes from its committed volunteer members representing the industry leaders from manufactures, SDO’s and other associations. 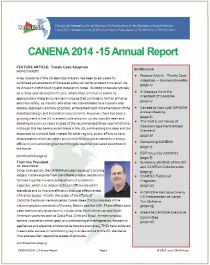 Information on current and prior CANENA Annual General Meetings. The Annual Report provides an account to our members, funding providers and supporters about how we have used these resources to purse our objectives in the reporting year, and to outline our aspirations for the ensuring year.